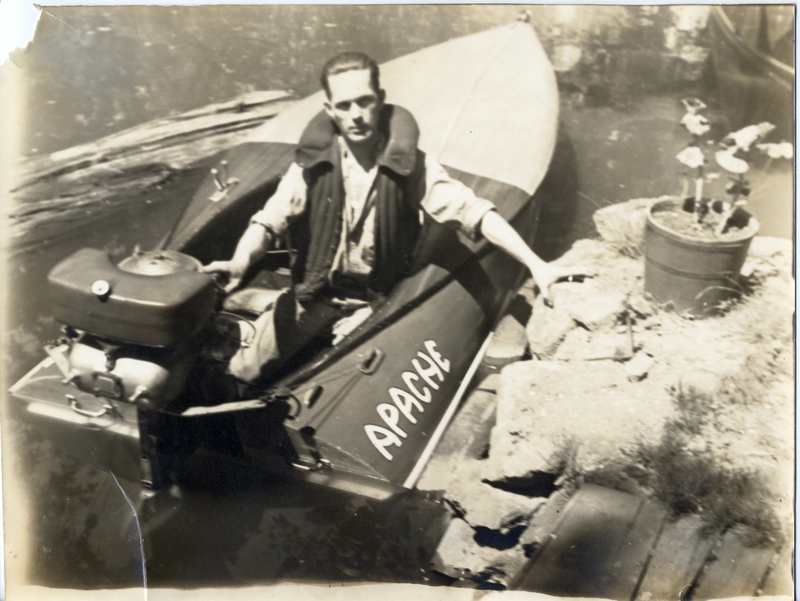 Jack Ofelt in his racing outboard motorboat (utility C runabout) on the Oswego canal. His R-32, 22-horsepower racer reached speeds of 35 miles per hour. He took three out of four first places in the 1936 Oswego Regatta and captured the high-point trophy. Photo donated by Jack Ofelt Jr., Dec. 2001. Transcription Jack Ofelt in his racing outboard motorboat (utility C runabout) on the Oswego canal. His R-32, 22-horsepower racer reached speeds of 35 miles per hour. He took three out of four first places in the 1936 Oswego Regatta and captured the high-point trophy. Photo donated by Jack Ofelt Jr., Dec. 2001. Physical Description H 7.5"" x W 10""